Medal for Valor, Type 1 Var 3, "Thick" Sub-variation, #139516, awarded in February 1943 to a Mounted Reconnaissance Corporal. Medal for Valor, Type 1 Var 3, "Thick" Sub-variation, #139516, awarded in February 1943 to a Mounted Reconnaissance Corporal. During a raid behind the German lines near Kursk, he and his detachment killed 8 Nazi soldiers and captured 3 wagons with valuable supplies. The medal is in very fine to excellent condition, much better than average for a Type 1. Comes with archival research. 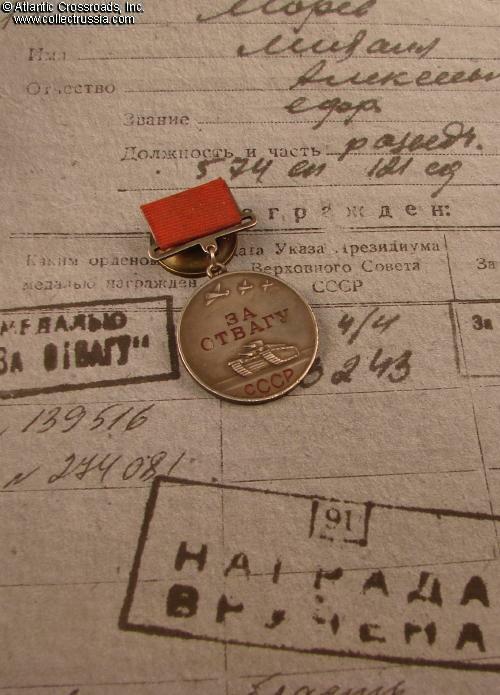 Medal for Valor, Type 1 Variation 3, #139516, awarded on 13 February 1943 to Corporal Mikhail Morev. Silver, lacquer; medallion is 37.2 mm wide. This is the so- called "Thick" sub-variation measuring approx. 2.8-2.9 mm thick at the edge. The suspension measures 25.0 mm wide at the top, approx. 17 mm tall not including the ribbon and the projection for the connecting link. 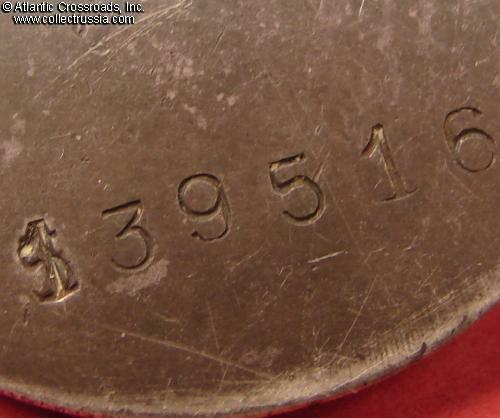 This medal features an interesting mistake by the Mint: the first digit of the serial number was erroneously stamped as "5", and this was then corrected by stamping the correct numeral "1" over it. The style of the stamp leaves no doubt that the digit "1" is legitimate. 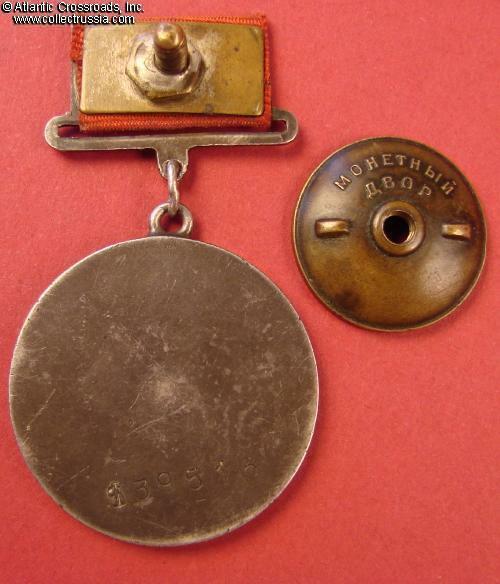 In very fine to excellent condition, outstanding for the Type 1 Medal for Valor. The original lacquer in the letters has a couple of chips and shows wear to its upper layer, but most of it still intact. The raised details are very well preserved and crisp, show only minimal visible wear. There are some minor dings to the raised edge, but overall the medal has far less wear than a typical WW2 example. 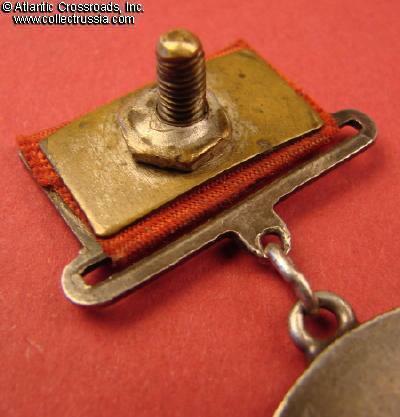 Comes on original suspension device, complete with all original parts including the screw post, back plate, hexagon nut, and mint marked screw plate. 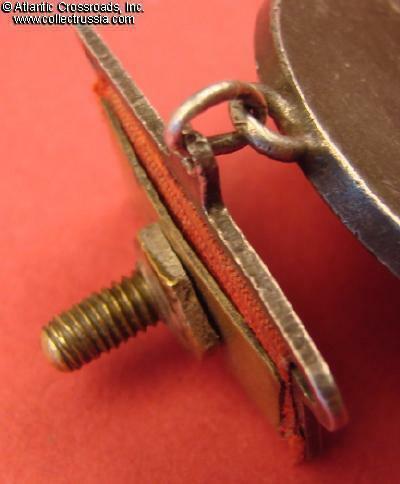 The projection of the suspension is worn thin by the weight of the medal and friction with the connecting link and it shows a tiny fracture, but nevertheless remains sound. The ribbon is very old, but well preserved, and probably original to the medal. The connecting link is original and has not been cut. 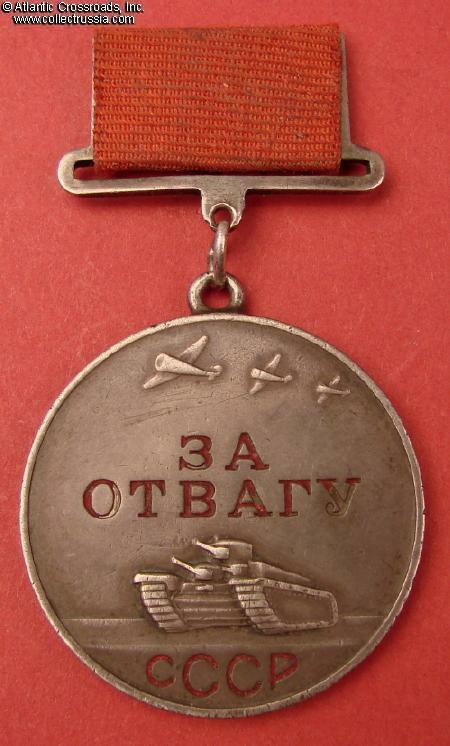 Overall, the medal is a very attractive example. Mikhail Morev was born in 1914 and prior to the Patriotic War, worked at a collective farm in the Yelets district of the Orel Region of Russia (this district is currently considered a part of the Lipetsk Region). 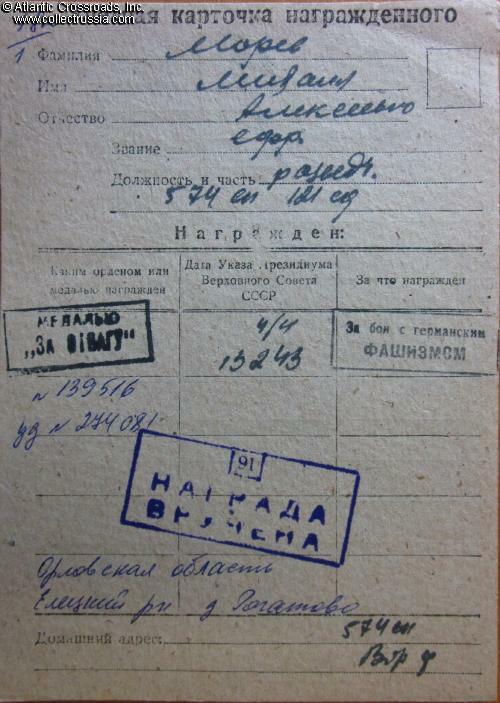 In early 1943, he had the rank of Corporal serving in the Mounted Reconnaissance Platoon of the 574th Rifle Regiment, 121st Rifle Division, 40th Army, Bryansk Front. 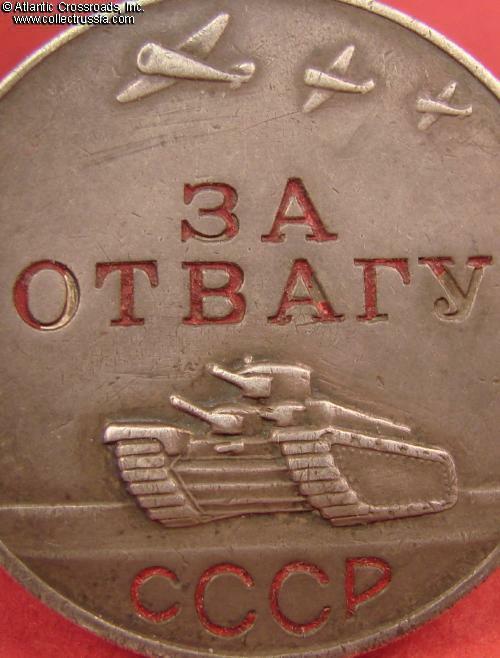 His division had been covering the approaches to the city of Kursk since the fall of the previous year, and it would remain in the area through the Battle of Kursk half a year later. According to a short citation in the award decree, Corp. Morev acted courageously during a recon raid near the village of Zorino in the Streletsky District near Kursk. He and his detachment killed eight German soldiers and captured three horse wagons with ammunition and food stores. It is interesting to see that the action took place not far from Morev's home in Orel / Lipetsk region, just to the north of Kursk. Research Materials: Xerox copy of the award record card and award decree containing the citation. 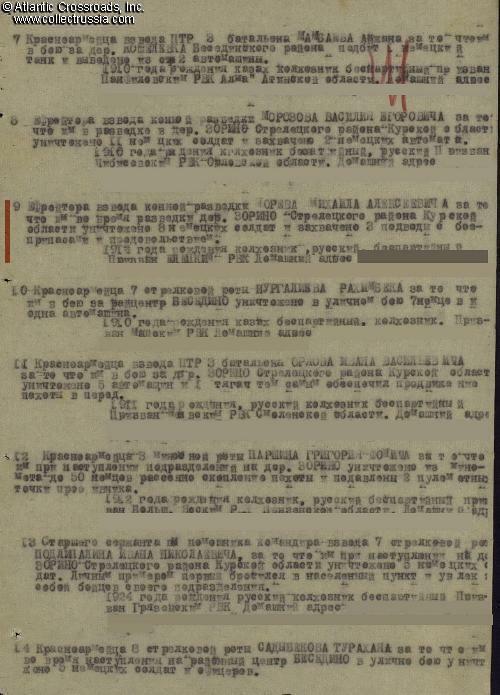 Information about the 121st Rifle Division is available in the Volume VIII "Red Legions" of the Charles Sharp's "Soviet Order of Battle" series.